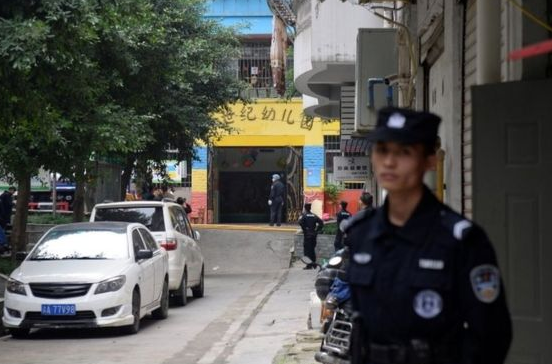 A horrific attack took place in China’s southwestern city of Chongqing on Friday when a knife-wielding woman attacked children at the gate of a kindergarten injuring 14 children. Police have identified the 39-year-old suspect only by her surname Liu. Liu shockingly launched her gruesome attack just as children from Xinshiji Kindergarten returned from their morning exercises at around 9:30 a.m. The local police also said that the injured children were receiving treatment in a hospital. The authorities are also taking to social media, particularly on Weibo, the Chinese Twitter, to give updates on the shocking incident. They also posted denials thereof rumors circulating that two children died of injuries. They also urged citizens not to pass on unverified rumors so as not to add to the confusion and anxiety. Liu was arrested following the mass assault on innocent children. The authorities have yet to establish a motive, however, for the violent attack. There were also videos posted on social media showing children walking to ambulances from the school gate, with some of them even being placed on gurneys. As shocking as the attack on school children is, unfortunately, this isn’t exactly the first time such a horrendous incident happened in China. A number of school stabbing incidents took place in recent years in Asia’s biggest economy, and authorities blame the violence largely on people bearing grudges or suffering mental health problems. In 2014, two knife-wielding women killed at least 33 people and wounded 143 others in a train station attack in Yunnan. Authorities later revealed that the women were part of an organized, premeditated, violent terrorist attack. One of the assailants was killed by the responding local police. Sale and possession of firearms are quite restricted in China, and mass attacks were often carried out with knives or homemade explosives. 20 schoolchildren were already killed in school attacks in 2010, triggering extra security measures from government officials. Schools have responded as well by adding gates and employing more security guards. Chongqing has a radical Muslim problem.